This is an invasive medical procedure to ascertain out whether or not there are any narrowing of the heart's arteries, the presence of heart disease, and how well the heart is functioning. This is also known as a coronary angiogram or a cardiac catheterisation. What is the Purpose of an Angiogram ? There are three main coronary arteries, that supply blood and oxygen to the cardiac muscle. These arteries are on the surface of the heart and are usually 3 to 4 millimetres in diameter. There are many branches of these three arteries. If these arteries become narrowed people may complain of angina (chest pain) or other chest discomfort and / or shortness of breath. If an artery is suddenly blocked this can cause a heart attack or coronary. The main reason for conducting an angiogram is to determine whether there has been any dangerous narrowing of these arteries. If the arteries have been significantly compromised the angiogram will help to determine the correct treatment for the patient. An angiogram will also gather vital data bout the pumping efficiency and valves of the heart. A light breakfast may be taken on the morning of the angiogram unless instructed otherwise. If on warfarin stop taking it five days before the angiogram. Other medications should be taken as usual unless otherwise instructed by your doctor. If you have diabetes, kidney disease, or other conditions, there may further steps necessary in order to avoid complications. You must arrange to be collected following your angiogram, as you are not allowed to drive or travel home unaccompanied. The angiogram is usually conducted in a specially equipped room called a Cardiac Catheterisation Laboratory, sometimes called a cath lab. An angiogram will usually take about 20 minutes to perform. You will receive sedation by mouth and, if necessary, a small amount of intravenous sedation, which will be administered by a drip in your arm to aid relaxation. 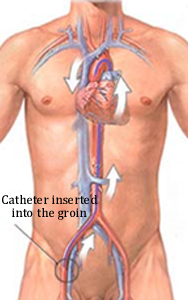 Under normal circumstances a blood vessel in the groin is used to access the arteries. On occasions the left leg or arm may be used. A local anaesthetic is administered to numb the skin over the blood vessel in the right leg. The vessel is punctured with a needle and then a tube, called a catheter, is passed up to the heart arteries using x-ray for guidance. A special x-ray dye is then injected which permits pictures of the heart to be seen and information to be recorded. This dye is excreted from the body by the kidneys after a two or three of hours. When the angiogram is finished pressure will be applied to the point of entry in the groin for up to 15 minutes following the procedure. This allows a seal to form over the puncture wound in the artery. You will need to stay in bed for up to six hours after the procedure. There should be no need for stitches however there may be some bruising and some soreness that may last for a couple of days. Sometimes an artery closure device may be used to seal the puncture site. This aids recovery and you may be mobile after just two hours. The doctor will discuss the results of your angiogram with you before you are discharged from the hospital and may make recommendations for further treatment. Because sedation is necessary to carry out an angiogram you will need to be accompanied home by a responsible adult. When you get home some body should also stay with you overnight. It is also advised not to drive, operate machinery or undertake heavy physical activity for at least 24 hours after the procedure.